I have a thing for artful haters, and Charlie Brooker (the grumpy British satirist, writer, critic, presenter, and producer) is one of my favorites. He’s no mere whinger, flailing around bitterly and attacking random things just to get attention. Instead he does what all good, self-respecting artful haters should do: calls out generic, manipulative rubbish; makes new stuff; and makes us think. Brooker is an angry Robin Hood for modern minds. He draws from the biggest and creepiest distraction-circuses out there (the Internet, the news channels, the TV industry, and the techno-gadget culture) and then writes thought-provoking articles and TV series to show how surreal and manipulative modern society is, and how desperate we are that we crave what they feed us. And he does it all with this kind of outraged bewilderment that is truly beautiful to behold. In 2011, he tried something new and produced a fiction TV show called BLACK MIRROR. It’s a dark, science-fiction anthology inspired by The Twilight Zone, and it’s one of the best things I’ve seen in a long time. The writing is brilliant, with high-stakes dilemmas, loads of drama, and some absolutely genius moments. The show explores the potential futures of the Twitter-generation with a totally new story, new characters and a new situation in every episode. “But they’re all about the way we live now – and the way we might be living in 10 minutes’ time if we’re clumsy. And if there’s one thing we know about mankind, it’s this: we’re usually clumsy. And it’s no use begging Siri for help. He doesn’t understand tearful pleading. Trust me, I’ve tried.” — Charlie Brooker. 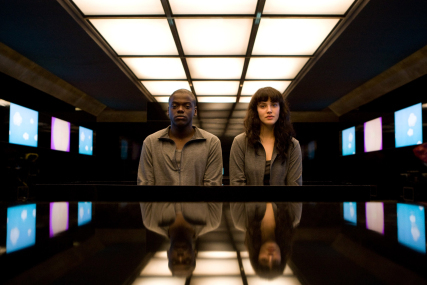 Black Mirror is speculative fiction and also a warning. Go watch it — it’s something special. Clip from episode 2: “15 Million Merits” (Season 2 is showing now in the UK).